This is more of a recipe to create a scarf that has Missoni-like stripes than an actual pattern. I used a variation of the well-known wave stitch, also known as chevron stitch or ripple stitch. There are many kinds of these stitches that use increases and decreases to create the characteristic wave effect. Any one of these type of stitches can be used to make this scarf. 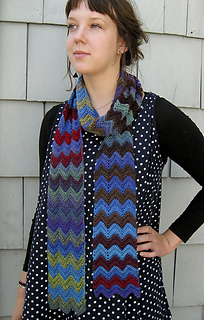 The pattern gives directions for a chevron stitch. Gauge is not critical as the width and length of the scarf are determined by how many pattern repeats and rows you decide to crochet. 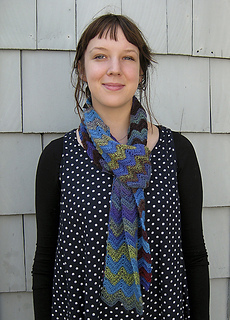 The scarf uses one skein of Crystal Palace Mini Mochi and one skein of Drops Delight.